The symbolism inherent in heart mandalas may seem fairly obvious, but there can be a much deeper meaning. The heart may be at the center of the mandala or incorporated throughout the heart mandala design. Colors included in the heart mandala can also be significant, giving the mandala a more specific meaning. All of the common heart symbol meanings give a heart mandala its basic meaning. The heart generally symbolizes love, of course, but there is more to it than that. It is the symbol for attraction, femininity and sensuality but it also symbolizes unity and cohesion. The heart can be used to signify the love and unity between partners but it can also signify love between friends and family members. The heart symbol is actually strongly connected to the triangle. In fact, it started out as a triangle which was originally the symbol for the divine feminine. Then they softened the symbol, rounding it so that it would more accurately reflect femininity. Heart mandala symbolism has a connection to the element of water based on its inverted triangular shape. A triangle that has its point facing down is a symbol of water. This connection signifies emotion and intuition as well as transition and motion in general. It can also signify psychic perception. Colors used in the heart mandala can be very significant. They can “fine tune” the heart mandala design to clarify its meaning. Green and pink in a heart mandala design give it a strong connection to the heart chakra, which is represented and activated by these colors. Red in heart mandala patterns signifies a connection to the root chakra. This is the power chakra. Sexual power and strong passion come from this chakra. Blue, green or blue-green in the heart mandala design give it a clearer connection to the water element, signifying motion, transition, emotion or intuition. 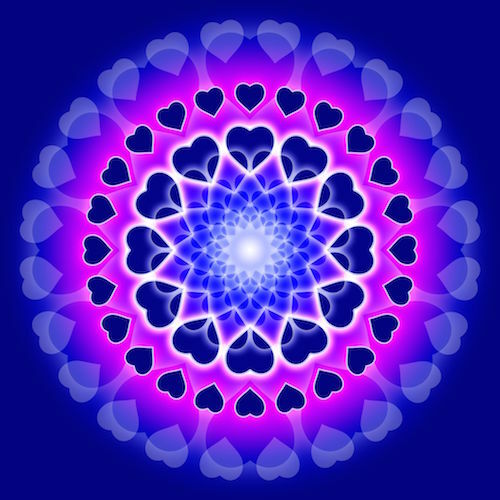 A stronger water element can be used in a heart mandala to enhance psychic perceptions in meditation. Additional symbols can be used to give the heart mandala patterns further meaning. For example, the use of a yin yang symbol within a heart shape or heart mandala symbolizes well-balanced, true love that is not dominated by the feminine or masculine. It denotes a good, even, balance of energies and true love. Art and jewelry depicting a heart mandala design is a wonderful way to express yourself, decorate your home or office and focus your meditation. Jewelry, like pendants and dangling earrings, is especially conducive to heart mandala patterns but this mandala can be incorporated in nearly any jewelry design. The mandala can be shaped like a heart or it can be round, rectangular or any shape you like. As long as heart shapes are incorporated in the mandala patterns, the finished piece will be a heart mandala. Etsy has a wonderful selection of heart mandala jewelry that you can buy online. The sky’s the limit on heart mandala art. Wall art like prints, paintings and banners can be large for big open wall areas or scaled down to fit in smaller wall spaces like the bathroom or hallway. The heart mandala design can also be any color or combination of colors to match your décor. Chakra colors can be used in the pattern or blues and greens to bring water elements into your space. 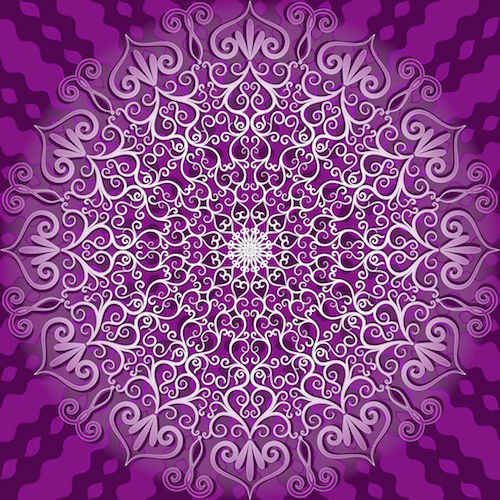 Heart mandala art can also be found on T-shirts, mugs and even shower curtains. Etsy also has a great selection of heart mandala art. Mandala coloring is a wonderful, relaxing and even therapeutic activity. You can color heart mandalas with anything you like. Colored pencils are commonly used to color mandalas. They are especially good for heart mandalas with a very fine pattern where sharp pencils work best. Paint, either water colors or oils, can be used to color your heart mandala. Charcoal pencils can be used to color a heart mandala in various shades of grey. Pastels can be used for muted colors. You use whatever you like. That is one of the aspects of mandala coloring that makes this activity highly therapeutic. You use what moves you. Heart mandala coloring pages and heart mandala coloring books can be bought online. Amazon has a great selection of heart mandala coloring books. Prices range from $5 to $20. Free coloring pages can be found online, too. Coloring Castle has a great selection of coloring pages for free. Just download and print them. You can also draw your own heart mandala from scratch for even greater therapeutic value. Heart mandala tattoos are a beautiful way to decorate your body and carry the heart symbolism with you always. Larger mandala tattoos can be more easily appreciated when they are on a larger, flat part of the body. That way, the whole heart mandala can be seen in one glance. The heart mandala also works well when the size is scaled down. Small heart mandalas, either rounded or heart-shaped, look great on an arm, leg, or even on the top of your foot. Go with shades of grey and black or have the tattoo artist add some color. Just like heart mandala art and jewelry, the use of certain colors gives mandala tattoos more meaning.